Get money for living expenses so that you can perform a research project in your lab for 8 weeks in the summer of 2020. What will I do in NU Bioscientist? First, you will take two specially designed first-year seminars: Biological Thought and Action (Biol Sci 115) and Science Research Preparation (Biol Sci 116). Biological Thought and Action examines the historical, ethical, and global impact of biological research. Science Research Preparation will help you develop critical thinking skills and develop a research project in cooperation with your lab. In the fall quarter, you will meet with program faculty and former program participants to help you find a research laboratory of your own choosing. After you successfully complete the courses, find a research laboratory, and submit a research proposal to Weinberg College, you will receive a living stipend, on-campus housing, and a mealplan for 8 weeks of full-time research in the summer of 2020. After the summer of 2020, you will be able to choose if you want to continue research, either with your current lab or by picking a new one. 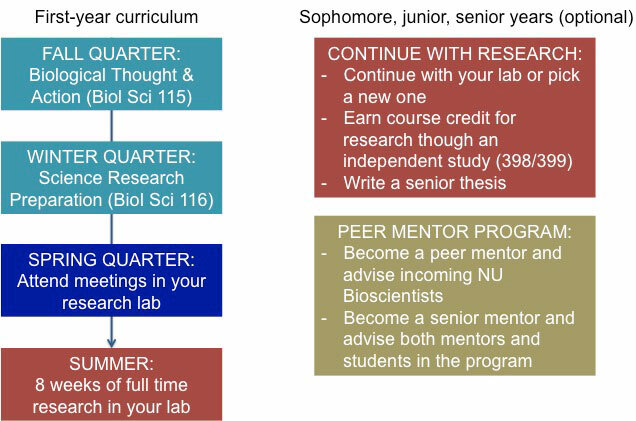 You can also apply to be a peer mentor for the program, advising the incoming NU Bioscientist class as they begin their research journey. Why should I join the NU Bioscientist program? You will get an early start on scientific research in a structured program. Faculty, staff, and graduate students will be available to mentor you throughout your first year and beyond. In addition, every NU Bioscientist is paired with an undergraduate mentor who has successfully completed the program. You will have special enrollment in the two NU Bioscientist seminar courses. Every student in these classes is a fellow NU Bioscientist, and they are just as excited about research as you are. While there are numerous opportunities for undergraduates to get involved with research at Northwestern, it is easy to get overwhelmed or confused if you choose to go it alone. Our program staff will guide you through every step of the process and keep you focused and on schedule. Click here to apply. Initial decisions will be made during the second week of July, so apply before June 30 for the best chance of being accepted.